Students who aspire to join various disciplines of engineering and their parents may be overwhelmed by the choices and their prospects. Hearing from professionals and academicians in various avenues of engineering and being able to clarify questions, would go a long way in preparing for one’s future direction. IEEE is world’s largest professional association and IEEE Kerala Section and specifically, Kochi Subsection has been trying to help these aspirants in these matters. IEEE in association with Cochin University of Science and Technology SB is organizing a half day awareness program on Engineering Studies on 7th October 2017, Saturday at NLB Seminar Hall, School of Engineering, CUSAT. This is expected to clear the doubts like, which discipline to be taken, what are the prospects for higher studies as well as jobs. Professionals in various Engineering disciplines from industries as well as academic institutes will be addressing and answering the questions. The Engineering aspirant student, as well as one of the parent, can attend this session. 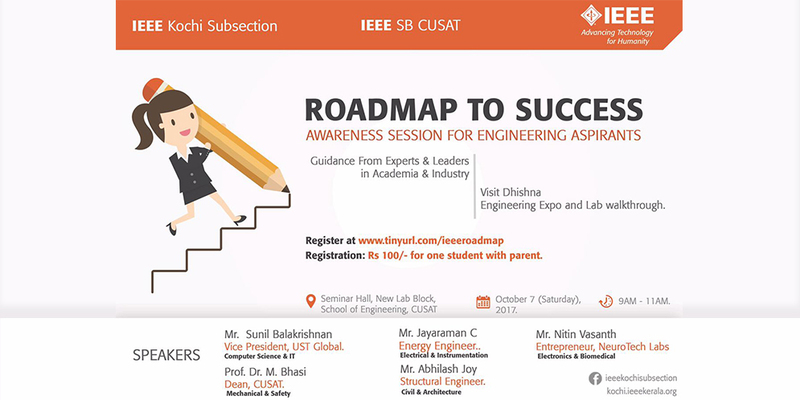 This session will be followed by a visit to Engineering Expo “Dhishna” held at CUSAT, to get a glimpse of engineering labs and experiments. A Registration fee of INR 100 (1 Student + 1 Parent) will be collected at the venue.